Fredrik Egerman and Desiree Armfeldt have reached middle age. They are at the crossroads, neither completely content with their lives. They have no plans to change anything. A summer weekend in the Swedish countryside with a sun that won’t set is about to change all that. 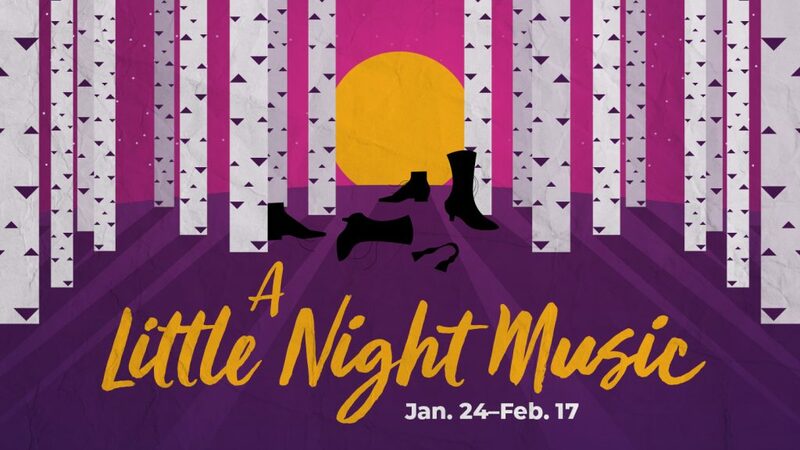 Stephen Sondheim, America’s most respected living composer of musical theatre, provided audiences with “A Little Night Music” on Broadway in 1973. The show has gone on to worldwide acclaim. Some productions boast lavish sets and large casts. The show arrived this month in Denver with minimal set, but more than makes up for that by providing excellent costumes, excellent voices and excellent direction. Director Kelly Van Oosbree’s clever staging even includes a rotating stage – power-operated by the performers. Everyone in the cast is in top form as they take on the show’s roles. Egerman is a somewhat stuffy lawyer with great memories of a liaison many years ago with the actress Armfeldt. He takes his young wife to a local performance of the touring company. Seeing Desiree on stage renews memories of his past love for her, and he succumbs to her allure. Their lives are about to change, but not without affecting several others – some deliciously bizarre. 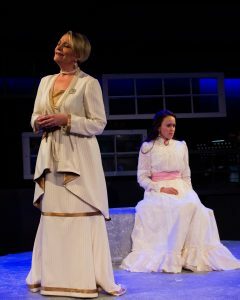 Rachel Turner is in delightful form as the young wife – happy to be married and have nice clothes and to go to elaborate balls; but horrified about losing her virginity. 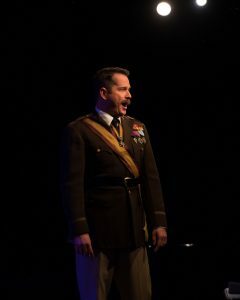 Jeremy Rill is enormous fun as the over-the top self-assured Count Carl-Magnus Malcolm, the military man currently dallying with the actress. His character has an ego as big as all outdoors, but reportedly has the “brain of a pea.” Sparring toe to toe with this army dragoon is his wife, Countess Charlotte Malcolm, brilliantly portrayed by Megan Van de Hey. Susan Long is the Armfeldt family matriarch – Desiree’s mother, and Fredrika’s grandmother. The country weekend takes place on her estate. She hasn’t much use for her actress daughter, dotes on her granddaughter, and lives in a dreamworld of the past, recounting her various “liaisons” with the rich and famous. Adding even more craziness to the goings-on are Frid and Petra played by Ryan Belinak and Lindsey Falduto, both worldly-wise servants. They are well acquainted with the upper crust, but appear to accept their roles in the lower echelons of society. Lindsey Falduto’s “The Miller’s Son” is especially poignant, as Petra realizes that she can serve the wealthy, but will end up marrying someone in her level of society. On the other hand, Lawyer Egerman’s adult son, Henrik, is a seminary student, with no idea of where he fits into the life of his family, or life anywhere for that matter. 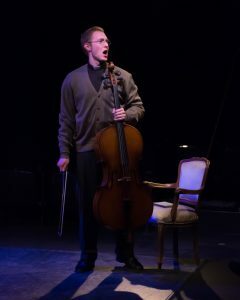 Barret Harper is superb on his own, as the bewildered, cello-playing Henrik. Excellent accompaniment is provided by Deborah Fuller (violin), David Short (cello) with Trent Hines and Angela Steiner (piano) — Hines for first three weekends, Steiner for final weekend. 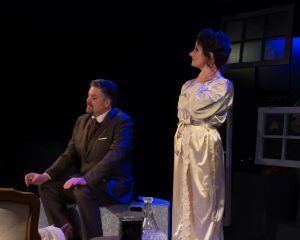 The musical was inspired by an Ingmar Bergman 1955 movie, “Smiles of a Summer Night.” Playwright Hugh Wheeler wrote the book, with Stephen Sondheim providing music and lyrics. The music is written as waltzes in three-quarters time. How I wish we’d been asked.